What happens when you cross two staple desserts? Deliciousness. 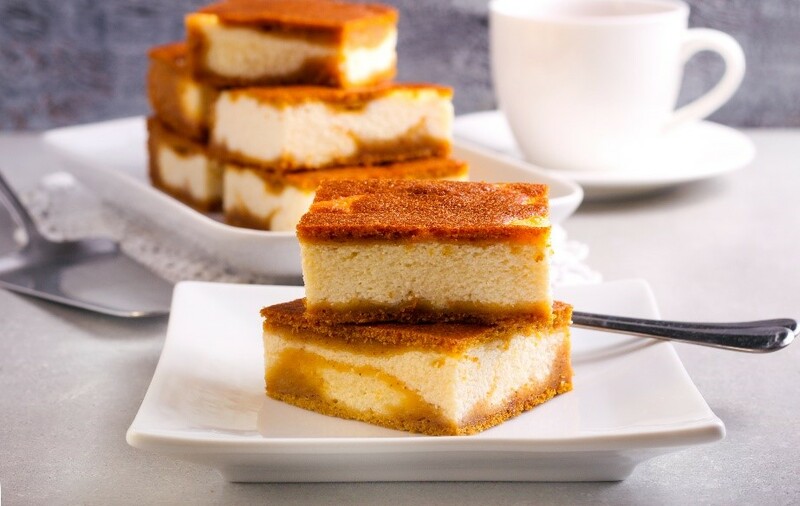 These pumpkin cheesecake bars are the perfect fall dessert to satisfy your sweet tooth. In a medium bowl, combine the melted butter and crushed graham crackers. Stir until the mixture develops a wet sand texture. Cover the bottom of a greased 9 x13-inch (23x33 cm) baking pan with the graham cracker mixture and spread evenly. Chill. In a large bowl, combine the cream cheese, eggs, vanilla, and sugar. Stir until mixture is smooth. Spread half of the cheesecake batter into the chilled baking pan, smoothing the top, and freeze. Add the pumpkin puree to the remaining cheesecake batter and stir until incorporated. Spoon the pumpkin cheesecake mixture over frozen cheesecake mixture and spread evenly. Make the crumb topping: in a medium bowl, combine the butter, flour, brown sugar, and cinnamon. Stir until all ingredients are evenly incorporated and the mixture develops a wet sand texture. Top the cheesecake with the crumble topping and bake for another 25 minutes. Allow the cheesecake to cool at room temperature. For best results refrigerate overnight once completely cooled, then slice and serve. This recipe first appeared on Tasty.